They are not the ideal egg substitute for light and fluffy cakes. Provided the cake you’re making is not solely dependent on the beating of the eggs and sugar together to provide fluffiness, you can experiment with fruit spreads. However, remember to add extra raising agent, such as bicarbonate of soda (baking soda). Leave out the sugar and use a no-added-sugar fruit spread instead. The sweetness level of a fruit spread is lower than that of sugar, so start by using the same amount as you would use sugar. Sometimes recipes use sugar excessively and you may not need as much sweetness. Taste the dough/batter and add more fruit spread or sugar (or some other sweetener) if need be. 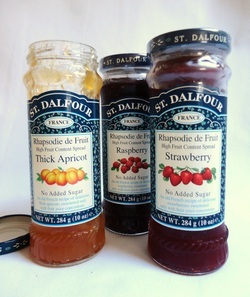 Check the consistency: if you use the same amount of no-added-sugar fruit spread as you would have used sugar and the recipe calls for a lot of egg, you may need to add extra liquid; if, on the other hand, you need to add a lot of extra fruit spread, you may have to increase the amount of dry ingredients. A potential problem with using no-added-sugar fruit spreads is that they add a distinctive taste, and sometimes also colour, to your baking. Peach and apricot fruit spreads have the most neutral flavours and colours, although you may still be able to taste them in your sweet treat. This may or may not be a problem. You can find out more about no-added-sugar fruit spreads and how to use them in baking here.